The PSS Arianrhod is a private trading vessel that plies her trade across almost every zone of the mapped galaxy. 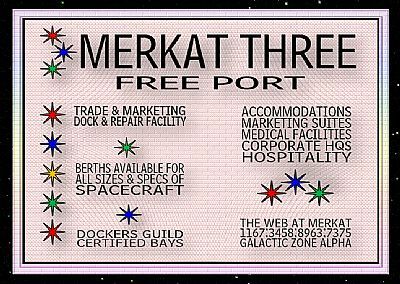 Operated by a motley crew of merchant spacers under the command of Captain Cinnabar Ahxenta, she is often to be found in the outer belts of the Web, a vast complex of repair, docking and trading facilities that orbits as a free port around the planet Merkat Three at the convergence of galactic zones Alpha and Delta (for tax purposes, Merkat space is classified as zone Alpha...). 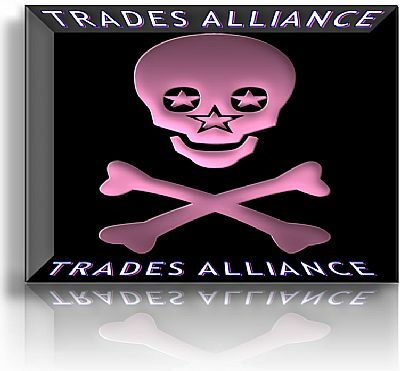 The Trades Alliance is also linked to a number of trading and other concerns, such as various free ports, either planetary or space-based, and to certain mining and other stations within the sectors of the mapped galaxy.